Be sure to pack your binoculars - this hidden treasure offers five-star views of the coast's most spectacular natural shows, from shimmering sunsets and winter storm-scapes to the occasional pod of whales passing far in the distance. Schilling Beach House is a family friendly four bedroom, two bathroom home perched right above the beach in secluded Arch Cape. The lot is large, the yard is fenced, and kids and pets are welcome! Inside, drink in endlessly panoramic views through a spread of picture windows lining the house's west side. You can keep one eye on the turning tides from the living room and dining areas as well as the kitchen and master bedroom. The home's heart is a large, comfortable living and dining area boasting a fleet of cushy recliners -- plenty of front row seats for catching the ocean action. You'll have access to a large flat-screen TV with satellite (DirecTV) and a DVD player, plus a CD/radio and iPod dock with speakers. Nearby is a clean, well equipped kitchen with lots of light. During downtime, keep the kids occupied with a collection of board games, books, and decks of cards. You'll also find a second TV/VCR with satellite and a collection of children's movies on hand. When evening arrives, take your pick of four bedrooms. The oceanfront master bedroom has a king sized bed, a 32 inch flat-screen TV/DVD combo and its own bathroom. You'll also find two bedrooms with queen sized beds and another room with two sets of bunks 3 twin and a full all close to a full bathroom. Outside, frolic in the large oceanfront yard, or step onto the huge west facing concrete patio for unfettered ocean views. There's even a fire pit perfect for marshmallow roasting! Settle in at the picnic table located in the covered patio area on the east side of the house and soak in the views from a comfortable distance, or get out and explore: there's beach access located right nearby, and a sun porch off the kitchen for kicking off sandy shoes and toys after a day of play. 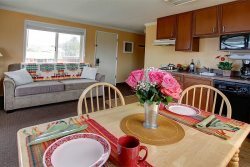 Cannon Beach Vacation Rentals offers these near-by homes as well; Falcon Getaway , Beach Haven , Pearl of the Cape, and Sunset Retreat. Communication as to the property location , condition, and above all the cleanliness of the house was spot on. The view was incredible. The pictures on the web for the Shilling house don't do it the justice it deserves for the views and scenery. You have to see it to believe it and take it all in. I would recommend for a getaway from the busy daily grind of life. Thanks for the memories. Great company and wonderful property! We have enjoyed our multiple stays at Schilling Beach House over the years-----this stay was just another of those memorable events. We will be back! The gift basket was a nice touch. Great location, very nice property and a wonderful staff that was very accommodating with regards to our stay. The hot water tank is turned very high; water extremely hot. Kitchen faucet leaks; might need to be looked at. All minor items; we had an incredible time and loved seeing what the new owners had done to the property. Thank you!! very friendly, knowledgeable staff going out of their way to make sure we were accommodated and well taken care of. Good housekeeping! Excellent office staff. Knowledgeable and friendly. Love it, hope new owners keep it a pet friendly vacation rental. Please let me know about if it opens for bookings in 2017. Thanks! All were friendly and helpful. Appreciated the call to say we could check in early but couldn't take advantage of it due to other commitments. We had a great time. Our elderly mother (94) cruised around the house with her walker and enjoyed the view from a recliner. The kitchen was well equipped. My husband did report meeting a rat in the garage while chopping the fire wood. Glad you had a great time! Sorry about the garage visitor - at this time of year even best efforts can be challenged by mother nature. Thanks for letting us know. Very good communication and we were given a gift certificate for a meal bc of the inconvenience of a Realtor visit. Your maintenance man was friendly and took care of a couple of minor problems quickly. The house was much roomier and more comfortable than it looks from the photos. It had everything we needed for a great vacation. Fantastic customer service especially Susan!! Wonderful, relaxing, beautiful and the view is breathtaking!! We have already reserved this beautiful home again in June and our hoping to bring our adult children to enjoy this home and the surrounding area. Thank you Susan and the entire staff we really appreciate your outstanding customer service, you make us feel like family!